There is only one difference between the gods and the mortals. And it spells the great divide between these two major forces of nature. It also demarcates a significant consideration in the estimation of each in their relation to one another. While mortals envy the power of the gods, the gods on the other hand envy the mortals precisely because the latter is as such—mortals, they have an end, they expire, they die, and death is one quality which the gods do not possess. The gods are an eternal fixture and boredom is their curse. And so, it has been said in classical mythology, that the gods would play prank on mortals, make them subservient, enslave them, make fun of them, pit them with one another, make them confuse, rattle them and the gods have a field day on top of where they wanted to be. The gods are constantly entertained and animated by the mortals. After all, notwithstanding the confusion they impose on mortals, they are still held sacred, prayed for, made sacrifices, everything almost dedicated to whoever the mortal is in awe. The gods remain as they are, powerful, almighty and yes, immortal. On the other hand, the mortals who felt weak, helpless and destitute seek supernatural strength through prayers and offerings. There are rituals to draw the gods’ attention. There are ceremonies, sacramental, submissions. There are career interveners, the priests, who are trained to tame and call on the gods as if the gods founded their congregations. Mortals pray for the gods to carry on the struggle for them. Mortals wanted their gods to do the bidding, to even confront the challenges, to rectify, to solve the problem for them. After all, the gods are powerful and omnipotent. The gods can make things happen, can make something impossible as possible, can flick a miracle or two in a wave of their hand. On several occasions however, the mortals at times were confused because the gods they subscribed to seem to be fighting and competing with one another. There is jealousy everywhere in the kingdom where the gods are ensconced. Mortals could no longer divine what god to call for. 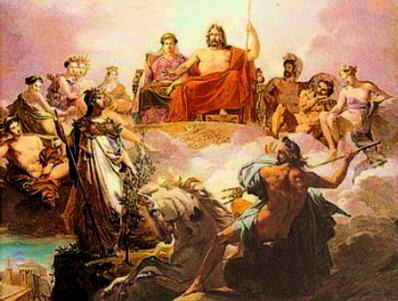 Homer wrote one classic story after another depicting the intramurals in Mount Olympus where all gods try to “outgod” one another to the detriment of mortals who were all scrambling for their intercessions. After all, mankind has evolved their understanding of the supernatural from animism to mythological proportion if only to gain a full understanding of their fate and their universe. They thought that powerful figures that look like man were better than a stone. Hence, the gods were fashioned after mankind’s profile and proclivities. One day, the gods out of their own follies faded in heaven. A bolt of lightning burst in the sky and man suddenly felt hopeless, they were jolted. In Far East they cried, “Theos”, in the Orient they cried “Dio”, in the Philippines they cried “Diyos”, in Germany they cried “Gott”, in Dutch they cried “Godt” , In Norwegian it is “Gud”, in England and in the New World, they cried “God.” It is God, the beginning of the term in capital and singular; no longer expressed in the plurality. The gods for a while lost their following and those who pursued became pagan. Spirituality was established. Verily, there is only one God and the rest are saints or prophets with specialties much like the gods before them. Pagans shifted to a belief system called religion and the gods of yesteryears were resurrected through faith. There is no more immortality in the language but there is only death as a qualification to claim a reward for loyalty. Mortals won their day with the gods and it is only in Heaven where they are joined in harmony.